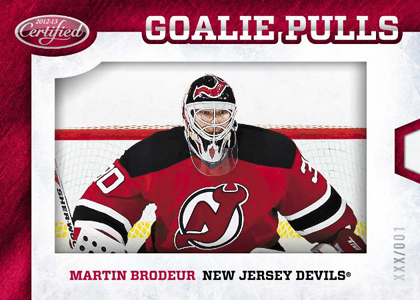 2012-13 Panini Certified Hockey has a 200-card set, half of which consists of subset short prints. These subsets include 20 goalie-focused Masked Marvels, 20 Immortals, 15 Certified Rookies, 25 Freshman Signatures and 20 Freshman Fabrics Signature Rookies. Freshman Fabrics Signature cards fall one in four boxes. 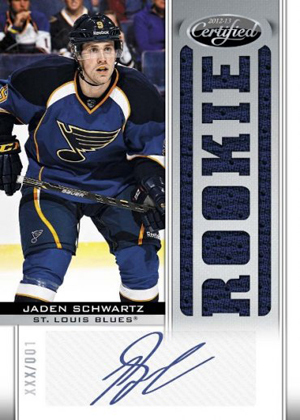 Good: Panini Certified features some of the best talent on the ice year after year, with some of the best early-season rookie autographs. Bad: The rookie talent pool is lacking due to the lockout, causing some of the hits in the product to be a little less desirable than would normally be found in the product. The Bottom Line: Panini Certified has always been a well-received product. However the lockout has caused a lot of the excitement of the product to be put on the back burner while the NHL deals with its own issues. The card design is something you come to expect with the Certified brand. Players have a great action shot. Backgrounds have enough holo-foil to make sure your hair is looking good. One of the issues I constantly think about when opening this brand is, "Are the cards too shiny?" At some point, the glare from the cards takes away from the design and this time I feel it really does. However, the Mirror parallels look fantastic as they are toned down just enough. Speaking with the front of the card, I find the cursive lettering sort of blends into the card a little too much. It should either be a little bigger or a different font. My eyes aren't old yet, but it's something that you should be able to read easier. Despite the base cards, the rest of the inserts look fantastic and are definitely stronger than in the past. 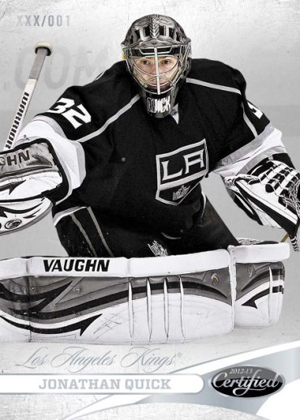 One of my favorites is Goalie Pulls that have a goalie on acetate stock. You can pull him out of his net. It's nothing ground-breaking, but the creative attention to detail was enough for me to love it. The checklist lacks the excitement that a product coming out at this time should really have. Yes, you have all your veterans you find in your products. You also have your rookies who got ice time late last season, which is standard as well. But the lockout has played a huge part in creating a checklist that is void of your new breakout stars and your recently drafted rookies that would be making an impact in the league as we speak. If you don't think the lockout affects more than just the players, owners, and people who work at the arenas, you're mistaken. The lack of rookie star power isn't Panini's fault, but it's still an issue. That said, the Fabric of the Game checklist continues to keep with the tradition of featuring players who have been established stars in the NHL for some time. The same goes for the hits that have extensive checklists of veteran and retired stars. They usually find the players that people want to collect and that is always welcomed. Again, the lockout continues to take its toll on new products. In general, hockey cards are slumping on the secondary market. It doesn't help that the lockout has caused a serious issue with getting better content in new boxes. While the hits are normally what you would find in a Certified product, the rookie autographs lack the excitement and value than if there was a season going on. For instance, you can pull an autograph of a little-known rookie. If the season were a go, that rookie could have a breakout season, which adds further value. This is on top of the bump that would occur if top draft picks like Nail Antropov were in the set as well. The only issue with the lack of the rookie content is that I can't really see where that content was replaced. New to this year are the "hot box" parallels, so that may be a bit of content that was added. But many would argue that memorabilia swatches hold less value than autographed cards. Unless, of course, you can find some of the rare stick cards that made their debut this year. It's tough to look at what the product could be if we actually had a NHL season. Overall, 2012-13 Panini Certified Hockey is a fun product to bust. 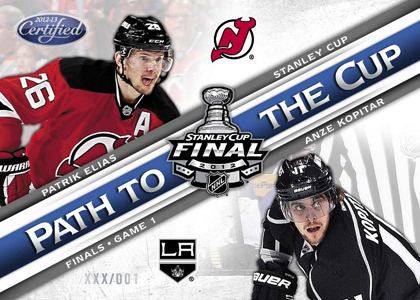 Despite the lockout, hockey fans need to keep their mind on the sport they love and Certified hockey does the trick. With four memorabilia cards per box, you're still going to find some nice cards to add to your collection with a large number of different players. Low-numbered parallels are another major plus. While the lockout has caused issues in hockey card products, that should not cause you to stop collecting. If anything, it might be a way to bring you closer to the game in these trying times. 2012-13 JAKOB SILFVERBERG CERTIFIED AUTO RC + 3 BONUS! ANAHEIM DUCKS! 2012-13 Panini Certified Chet Pickard Auto Rookie Jersey RC 400 499. #182. Another good product coming out! I decided for the time this year I would participate in the wrapper redemption offer at the Fall Toronto Card Expo so I bought a box of 12 – 13 Certified to qualify me for 6 packs. I was pleasantly surprised that as the direct competition to the UD Artifacts, this delivered value on top of value. The hits kept coming pack after pack. I love the autographed die cut jersey cards; especially mine ( Sven Baertchi ) If you are considering a nicer product to buy, I recommend this one. Love this set, the inserts are sharp and fit well in to the product. The base cards all look nice. For the price point this product delivers a great value with hits and general collectability. I will be working to finish my base set as well as looking for a few key PC hits from this set. I have never actually purchased these particular cards. However, I have purchased the foot ball certified. Very good quality cards sure. Browsing through the list of players in this set can be very impressive. I got a stick card but my hand got syuck to the card don’t buy this brand I emailed players like Crosby and Tavares and they agreed with me. -Very nice product. other than a Kane Jersey card (out of 150 )come damaged out of the pack. 6 of 10** can this be an error, all checklists have it out of 50? Nice product. Either you get a fantastic box or a worthless (ie Daniel Alfredsson) one. Your card /10 is a prime version probably dual patches. There was a standard/jersey/prime version of these cards as stated on the pack you pulled it from. “I emailed players like Tavares and Crosby and they agreed with me.” Yes, I’m quite sure they’re outraged that sticks on cards are poking people or whatever your weird-a** complaint was. Otherwise, a decent product. Bought a case of blasters, and was surprised at the ratio of auto’s to memorabilia cards. Pulled many freshman signature cards. 2012-13 Certified Factory Sealed Hockey Hobby Box 4 Autos Memorabilia per Box !